I know, I know, I ought to use my limited blogging energy and time to post that big ‘ol Best of 2010 list. But I can’t help myself: I have to tell you about these few. They just arrived within the last day or so–one just a few hours ago–and I’m all jingly. Just have to tell you. So here are a few new ones, the best so far of the new year. 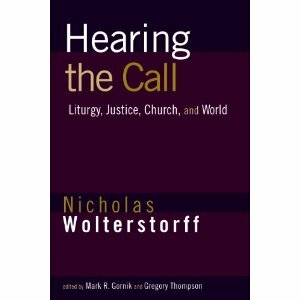 Hearing the Call: Liturgy, Justice, Church and World Nicholas Wolterstorff (edited by Mark Gornick & Gregory Thompson) (Eerdmans) $30.00 I suspect that those who know of his work and reputation will need no convincing: Wolterstorff, the Noah Porter Professor Emeritus of Philosophical Theology at Yale University, is truly one of the great philosophers of our time. He came to prominence in the 70s—I think the first time I knew of him was reading his serious review of his friend Calvin Seerveld’s Rainbows for the Fallen World. (Nic had just done his own book on aesthetics, Art in Action, and Seerveld had reviewed that.) Many found his brief and tender diary kept after the tragic death of his young adult son, Lament for a Son, to be eloquent and helpful. Reason within the Bounds of Religion was nearly seminal, giving birth to–or at least giving public understanding to–what became known in some circles as “reformed epistemology.” His Until Justice and Peace Embrace brought renewed conversations about social justice to those with an intentionally Reformed worldview and it remains a significant contribution to culturally-engaged public theology. He has a book on a Christian philosophy of education, and a book on higher education. And these meaty works are mostly semi-scholarly, designed for non-academic readers. He has numerous academic works as well; last year, Princeton University Press released his heavy text Justice: Rights and Wrongs (a companion volume will come out on Eerdmans later this Spring.) Cambridge University Press released a two volume hardback set of philosophical essays. All in all, Wolterstorff has been one of our more prolific serious authors, with a wide variety of readers lauding him. On the back cover of this new collection we have rave comments from Notre Dame’s Mark Noll (natch), Nigel Biggar (a scholar from Oxford) and a great endorsement from Gabe Fackre, a fine UCC theologian from Andover Newton. This new book weighs in at 450 pages and includes essays, articles, sermons and shorter pieces, a compendium of good stuff from years of his semi-scholarly journal articles and his popular magazine pieces. Nic has long been intensely engaged with issues of liturgy and justice and how faithful worship can compel faithful living in the (global) culture. Here, he looks at topics as wide ranging as the role of worship, church hymnody and liturgical space to his own journey to justice (via the deep pain amongst black scholars in South Africa and an ever-heightening sense of the pain of the Palestinians. There are pieces on lament, a study of women in the Bible, a few on a truly Christian view of politics and the state. Again and again, he comes back to the Biblical theme of shalom and the need for a just sense of human rights. An interview with him—“How My Mind Has Changed About Justice” is especially illuminating. I have clipped several of these stellar pieces from old magazines, and am delighted to have them here, in one volume. Hearing the Call: Liturgy, Justice, Church, and World is more than a thrown-together collection of occasional pieces (although that, too, would be worth having if from the pen of N.W.) It is a coherent and wisely arranged anthology, a volume that astute readers will return to again and again. Thanks to Gornick for gleaning these and thanks to Eedmans for releasing it. Contemplative Vision: A Guide to Christian Art and Prayer Juliet Benner (IVP) $17.00 I maintain that IVP is the most consistently good publisher of solid religious literature today, and their formatio line of contemplative resources never fails to impress. Once again, they hit one out of the ballpark with this handsome, holy, paperback that I’ve anxiously awaited. It is a wondrous example of not just lectio but visio divina, slowly pursuing a sacred gaze, reflecting on the full color paintings beautifully reproduced in a centerpiece signature. For those who follow inter-disciplinary spiritual formation resources, you may know the Conversations journal (edited by the brilliant Gary Moon whose books we highly recommend.) In that semi-annual, there is always an art piece, with gentle meditations and a good invitation to explore our inner selves by way of these classic artworks. Think of the fine introspective work done by Henri Nouwen in his beloved book Return of the Prodigal Son, or any good work on praying with icons. This is that sort of approach. Drawn from those columns in Conversations Journal, Ms Benner—trained as a visual artist, now a spiritual director—has given us all a great and lavish gift. She includes meditations moving us towards “Transformed Awareness” (with Bruegel the Elder and Vermeer and others) and “Transformed Vision” (using Rembrandt, Caravaggio, and many more) and “Transformed Living” (with paintings by artists as diverse as He Qi and Peter Rubens.) Wonderful endorsements on the back are from the Margaret Guenther (Holy Listening) and Ruth Haley Barton (Invitation to Silence and Solitude and Sacred Rhythms.) Very well done. practical touch, with just the right amount of goofiness, to boot. Nothing has quite been done like this and I seriously think it is a hugely significant book measured by the lives it will touch and the impact it will have. I happily admit that Derek is one of my best friends and that some of this work was hammered out in stimulating conversation over the many books he bought here at Hearts & Minds (and the many cups of soup he bought me at a local joint.) Derek has followed the very best discourse on worldview formation—-from Walsh & Middleton to Steve Garber, from David Naugle to James K.A. Smith—and has allowed these deep and profound writers to inform his playful, funny handbook to the big questions young women and men simply must answer if they are going to succeed in college. As youth ministry stalwart Chap Clark (author of Hurt: Inside the World of Today’s Teenagers) puts it, “For years I have been looking for the right book to give to Christian high school grads: readable, honest, grace-focused, Christ-centered, and practical. 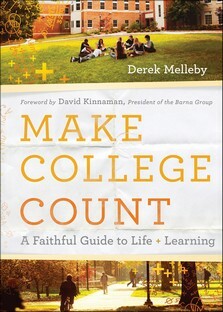 Finally, I’ve found just the ticket—Make College Count is that book.” I’ll write more about this, but we are thrilled and honored that the good folks at Baker got me a handful of these to show off early. We are the first place in the free world to have these and I couldn’t be happier. If you know any high school students currently doing the college circuit tours, or trying to figure out who they are and what they should be doing next year, this would be a sweet, nicely packaged, handsome little hardback gift to give as soon as you can. This is the right stuff. 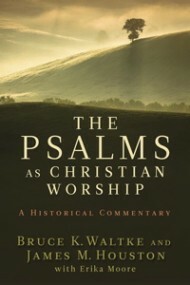 The Psalms as Christian Worship: A Historical Commentary Bruce Waltke and James Houston (Eerdmans) $28.00 I’d promote this book with enthusiasm if it were twice the cost! It’s a bargain at this price with 625 pages of rich, rich, work; in fact, this is nearly two books in one and it is easy to explain its value. First, Dr. Bruce Waltke, professor emeritus of biblical studies at Regent in Vancouver, is one of the great Old Testament scholars around. Here, he does the long-awaited literary, exegetical work he is so known for, offering serious and very readable (and very useful) nuggets of insight about a dozen or so representative Psalms. He has taught and preached the Psalms for fifty years, he says, and it surely shows in the tone and style. Dr. James Houston—a legendary ecumenical writer of deep thoughtfulness—offers a second layer of insight by doing a historical survey of how these same Psalms have been considered down through church history (even doing some helpful new translations of Latin stuff.) Houston (a founder of the prestigious C.S. Lewis Institute in Washington DC area) moved decades ago to Vancouver to teach spiritual formation and what he termed “spiritual theology.” Eugene Peterson was his successor there at Regent, if it gives you a sense of his level of mature and gracious thinking. Houston is a wide-ranging scholar and historian of ideas and is very rooted in the church fathers and mothers, the medieval mystics, the Puritans and other streams of spiritual renewal. I’ve listened to his tapes and have friends that know him well and esteem him like few other leaders. He is an orthodox, reliable guide to the best of the best writers of church history. In Psalms as Christian Worship he uses his good knowledge to supplement Waltke’s already brilliant research. This one-two combo of no-nonsense, serious writing with a devotional tone is a gift to anyone who loves the Bible, anyone who appreciates the Psalter, and anyone who wants to join the best of contemporary evangelical study with a discerning insight about the traditions and insights of the past.